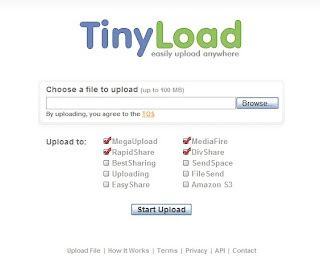 Tinyload is a file upload service that lets you upload file to some popular storage host sites once time, such as MegaUpload, MediaFire, RapidShare, DivShare, Amazon S3, and other. So you can upload a file to several storage platforms once time, it is very convenient. The creator is a student of Ohio State University.